L 16 1/2″ (42 cm) W 40″ (102 cm). Description: Sexes similar. 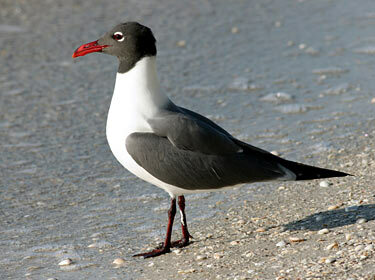 Breeding adult has black hood; white underparts; slate gray wings with all black outer primaries; and red-orange bill. Winter adult totally loses black hood and has a black bill. Second winter bird has gray wash on sides of breast, lacks hood, and has dark bill. First winter bird has extensive gray sides, dark brown wings, dark bill, and dark gray wash on nape. Juvenile is brown overall with a dark bill. 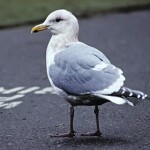 Habitat: Usually associated with coastal habitats, but vagrants can be seen near large water bodies in the interior. Where in Nebraska: Rare vagrant. Sightings reported from Keith County in 1947, 1950, and 1952; from Platte County in 1953; and in Lancaster County during 1977. 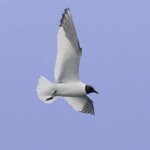 Field Notes: The male and female Laughing Gull usually build their nest together. If a male cannot find a mate, he may start building a nest platform and then use it to attract a female. 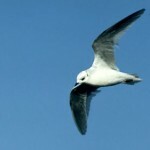 Fun Facts: Has been known to land on the head of a Brown Pelican and take fishes from its gular pouch.